Inside Shaq's Nightmare, The Day Nike Called Hedo, and the obvious Disney World v. Disneyland. The Orlando Magic and L.A. Lakers are about to tip-off in the most unappealing Finals since Spurs v. Knicks circa 1999. As basketball fans, we would have loved Kobe v. LeBron and to tell you the truth I would have settled for a tough bang around Denver v. Orlando series. Unfortunately, more Kobe doing awkward press conferences and more of Ron Jeremy post game interviews, WHERE AMAZING HAPPENS! Got a stance on LeBron refusing handshakes and opting for the team bus? The least the guy could have done was hit the press conference for the media, right? I debated to hold off on this one till Keep It Real Friday, but in the interest of devoting more time to teams still alive, I'ma get after it right now. A wise man once said "Heavy is the head that holds the crown," if your going to be the "King" then you've got to BE THE KING, good times and in bad. Put the Michael comparisons to bed folks, the coronation won't take place in '09, as for LeBron willing his band of misfits to the title, woahhhhhhhh not so fast. I don't care that LeBron is still very young, nor do I care about shaking hands with the people who just ended your season, but to leave your teammates and coach to fend off the wolves while you sulk on the team bus, come on I think you've waived your rights when you put on the Big Apple Nikes and tell the world to WITNESS. Final thought time, 2003 ALCS Tim Wakefield gives up a series over, curse continuing, walk-off homerun in the house that Ruth built, that's a tough night. Getting knocked out of Eastern Conference Finals in just your 6th season, that's a bump in the road. Get over it LeBron, you have a long way to go to reach His Airness. This really is Shaq's worst nightmare. His nemesis is back in The Finals for the second time without him. As luck would have it, they're playing against his former coaches team, the same former coach who he berated in a gibberish rant earlier this season. So which one of Shaq's nightmares comes true? I'm not giving you the winner just yet. However, for Shaquille O'Neal, the Lakers winning a title can't feel good. The Lakers ownership choose Kobe over Shaq, winning a title will prove that they were right. Kobe Bryant is overdue, he may not be able to drop the Celtics, he may not be liked by close to anyone, but all in all Kobe Bryant is a fantastic talent and has proved his skills, a title cements that. For Shaq, anything he says at this point has just become obnoxious if it hasn't already. They'll be no rapping in night clubs if Kobe puts on another ring, just more buzzing in your ear from a player who is clearly over the hill. Jim Henson called, he wants his LeBron puppet back. True, next time include a question. As for the Nike executives who approved launching the Kobe v. LeBron campaign prior to it being locked in, serves you right. Now I know that I've been a huge fan of conspiracies in the past, but as far as 2009 goes, no conspiracy here. Let me paint you a little picture here: Nike is to the NBA as New Era is to the MLB, it's their signature for Christ sake. If this was a fix job, LeBron and Kobe wouldn't be playing each other ONLY on the golf course. If this was a fix job, Hedo Turkoglu wouldn't be playing catalyst in the NBA Finals. If this was a fix, the most commercially viable player in the league wouldn't be watching at home. The King James puppet is back in the closet while Nike is scrambling for a replacement, ouch. Quick question, do we like Kobe Bryant if he pulls on that elusive post-Shaq championship ring? Can't do it, sorry. Listen, this is America and in this country we do guilty till proven innocent, it's the way it is. After Colorado, Kobe will never appeal as much to the masses as he once did. Under Phil Jackson, how does another ring make Kobe the main story? Jackson will be the best modern day coach of all time and Kobe's just that guy with a bad rep. putting another ring on. No amount of Kobe Bryant rings or documentaries are going to make us feel one way toward him or another, if we think he's real then we'll let you know, till then keep trying. What are you most excited about with these Finals? The masses that don't normally watch may tune in for a couple minutes here and there, if they get to watch Dwight Howard become the most dominant big man in the league, then this was worth it. 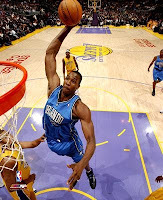 If not for the dunk contests during All-Star Weekend, Dwight Howard is just another NBA center. This Finals should make him a national name and no longer force him to play third fiddle on a t-mobile fav 5 commercial. No one can stop Dwight Howard, they can only hope to contain him and the Lakers and their soft big men are going to experience that in the flesh. That's what I can't wait for. If your Magic guard Rafer Alston, aren't you a little pissed off about all the talk surrounding injured guard Jameer Nelson making a come back in this series? Nelson was an all-star when he suffered his season ending injury earlier this season, but Alston is the point guard who has had some very big games in these playoffs. A combined 44 points for Alston in games 3 & 4 of the Eastern Conference Finals. 21 points and 10 assists in Game 7 of the first round matchup with Philly. Alston will be the starter make no bones about it, he won't be playing in Orlando given that he has proven he can start and make an impact in this league. Jameer Nelson isn't Rajon Rondo, Derrick Rose, Chris Paul, or Deron Williams, so in my mind if he plays or not isn't as big of an impact, especially when he'll have rust on him. We need to give Alston some credit, he's come up huge in these playoffs and I'm not confident that the Magic would be here had he not produced the way he has. Who on the Magic is expected to play Kobe Stopper? First off, there is no such thing as "Kobe Stopper." The fewest amount of points he scored in a game this postseason, 15 and that night he had 7 boards and 5 assists and oh yes, the Lakers won. However, the lane gets shut down by the defensive player of the year, Dwight Howard. Howard changes shots, forces Bryant to get his points in other places, which he can do by the way. In the last series against Denver, Bryant had as many as 3 games which he shot 50% or better, he's getting into his groove and it can get scary. The Magic won't be in awe, they've got players who can attempt to contain him. Guards Mickael Pietrus and Courtney Lee will be given the task of slowing Kobe down. These players can cover Kobe all over the floor, but it'll take a performance like the one they displayed on James in the last series. Stopping Kobe is an impossibility, and at times so is slowing him down. Obama picked the Lakers, will you? Ugh, Yes I will. As much as I'd like to see the Lakers lose, Kobe Bean Bryant is about to explode his team to a championship. When the chips have been stacked against the Lakers, they've risen to the occasion time after time this season. Beating Boston and Cleveland earlier this season on a road trip, getting the best from Houston, and then laying the wood on Denver over the final two games of the Western Conference Finals gives the Lakers that same look we expected from them earlier this season. With that being said, Lakers in 6. Tell Shaq how that tastes.